The Pithapuram estate was ruled by illustrious sons of Rao family, beginning from Sri Rao Rayanam Garu in 1602. In the succession, later on, NeeladriRayanam Garu was recognized by Moghul Vice Roy as Rajah of Pithapuram. 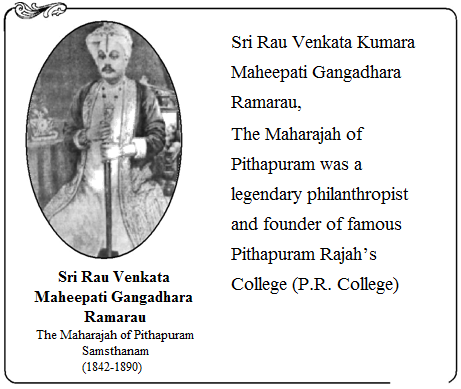 His eldest grandson Sri Rao Venkata Mahipathi Gangadhara Rama Rao became the Rajah in 1861. He was good administrator and legendary philanthropist. Today's P.R. Government College was first started by him as a High School in August 1884. In appreciation of his services the prince of Wales conferred on him the richly deserved title "Maharajah" in 1887. Later he was nominated as a member of the then Madras Legislative Council in 1877. He was blessed with a son on 5th October 1885 who was named as Surya Rao Bahadur. The child lost his mother on the third day after his birth. Sri Gangadhara Rama Rao also died in 1890 when the child was five years old. Smt. Rani Bhavayamma Rao of Chitrada groomed the boy. At the age of nine he was sent to Madras where he had his High School education in Newingdon School. He passed his Matriculation Examination from Madras University at the age of seventeen. After winning a legal battle he ascended the throne and became the Maharajah of Pithapuram on 19-02-1907. He married Rani Chinnamamba Devi, Daughter of Sri Rajah Venkata RangaiahAppa Rao of Nuzvid Estate. Sri MokkapatiSubbarayudu was his tutor in Madras High School, who moulded the Rajah into a fine gentleman with noble qualities. Sri Subbarayudu was a genius and a scholar in English, Telugu & Sanskrit. He was a great visionary. He was brought as a dewan of Pithapuram Estate. He had done Yeoman service to develop the estate. Sri Surya Rao Bahadur himself was a scholar in English, Telugu and Sanskrit languages. He was a lover and patron of men of letter and artists. Pithapuram estate flourished well during the reign of the Maharajah. More than any one, it was Brahmaharshi Venkata Ratnam Naidu garu, the revered guru of the Maharajah, who guided him in matters of religion, education and social reform. He also encouraged him in works of charity and welfare of the people. The Pithapuram Durbar was an abode for all men of letter, writers, pundits and musicians. It was really a golden age for Pithapuram. Like Sri Krishna Deva Raya, the Maharajah encouraged many poets and writers in his court. Veritably the Court was a nest of nightingales. Pundits like SripadaLakshminarayana Sastry, Tata Subbaraya Sastry, the famous musician Sri T. Sangameswara Sastry adorned the court of the Maharajah. Sri Panugantivaru and Devulapalli Brothers, and Venkata ParvatisaKavulu were the "Court Poets". Similarly a number of famous Telugu writers like Chilakamarthi and VeeresalingamPantulu were welcomed and honoured. The Maharajah's service to Telugu literature was commendable. The Telugu Academy was started under the guidance of Late Sri JayantiRamayyaPantulu Garu. He took keen interest in publishing old manuscripts. With enormous financial assistance he brought out an Encyclopedia in Telugu, which was named after him, the Surya Raya Nighantuvu' A number of eminent scholars like late Sri KasibhotlaSubbaraya Sastry and late Sri DivakarlaVenkatavadhani were employed for the work. In recognition of his service to Telugu Literature, the Andhra University conferred on him D.Litt and Kalaprapoorna. It was in the Maharajah's Court that the great Veena exponent late Sri T.Sangameswara Sastry spent his whole life as estate musician. (1873-1932) There were a number of episodes about his expert rendition on the Veena. Tagore once visited Pithapuram and Rajah donated one lakh of rupees for Santhinikethan. Brahmoism - a sort of refined Hinduism - practiced and propagated by the Maharajah under the benign influence of his great guru late Sri Raghupati Venkata Ratnam Naidu. Brahmarshi Sri R. Venkata Ratnam Naidu Garu, was a servant, a scholar of eminence and a staunch Brahmo leader. With his imposing personality and dignified figure, with his religious fervour and zeal for social reform, he exercised a wholesome influence on the intellectuals of Kakinada. He was the Principal of P.R. College for 17 years. Kakinada was a seat of Brahmoism for three decades. The BrahmasamajamBrahmoMandir opposite to the Science College was the citadel of Brahmoism. Here marriages were solemnized under the guidance of Sir R.VenkataRatnam Naidu, Dr. Vemuri Ramakrishna Rao and Sri Peddada Rama Swamy, Eminent scholars used to deliver lecturers in this Mandir. Till recently it housed the library of Sir R. Venkata Ratnam Naidu. The Maharajah spent huge amounts of money on education. He raised the P.R. College to the First Grade status in 1926, when the Andhra University was started in the same year. P.R. College is the pride of Kakinada, the first of its kind in this area. Here girls were given education free. The Science College, the High School and the attached Hostels were the gift of the Maharajah. When the strength grew in numbers, the Arts college was shifted to the present building situated in the heart of the town. It has an area of 36 acres full of green lawns and mango trees. The place now occupied by the Super Bazar, the L.I.C. building and Venkataratnapuram are the gifts of the Maharajah. The Building where Sir R. Venkata Ratnam Naidu lived and passed away was given to the Harijan Hostel in Venkata Ratnapuram. The Maharajah's heart was tender and full of the milk of human kindness. His compassion for the poor and the depressed classes and his concern for the Harijan Girls resulted in the birth of an orphanage. The beautiful and spacious building which is now Rangaraya Medical College was the orphanage run by the Maharajah of Pithapuram. Here Harijan Girls were fed, clothed and given free education. The Maharajah took up the Harijan problem even before Gandhiji thought about it. So too in Pithapuram there used to be a similar facility for Harijan Boys and Girls. The Shastipurti celebrations of the Maharajah were held for five continuous days at Pithapuram. It was a splendid spectacle for all, a feast to the eye and the ear. poets and musicians, pundits and philosophers, artists and actors, the poor and the needy received invaluable gifts on the occasion. He personally distributed silver bowls containing gold coins to all the scholars and pundits. It was a land mark in the life of the Maharajah. In 1948 with the abolition of the 'Zamindari System' the Maharajah handed over the management of the College with its assets and buildings to the Government of Madras. The century old institution, trained thousand of students and provided opportunities to many students to serve and work in the institution. Many eminent administrators, scientists and artists were the products of this great institution. 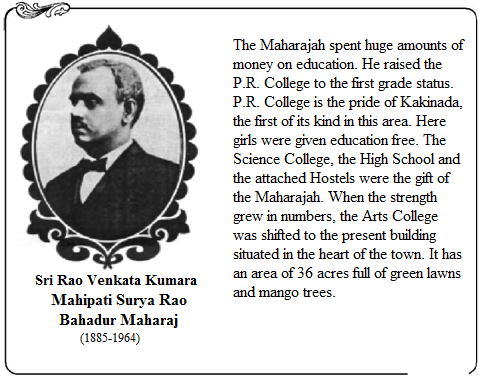 The College was the heart of Sri R. Venkataratnam Naidu Garu and the orphanage was the darling child of the Maharajah. The Maharajah passed away in 1964 With him the glory of the estate also waned and an era ended. He was a fine gentleman, cultured, dignified and charitable. His charity knew no bounds. The spirit of the Maharajah Broods over the college. But his college, a temple of Learning stands there forever spreading sweetness and light, a monument to the munificence of the Maharajah. We shall remember him with profound gratitude.